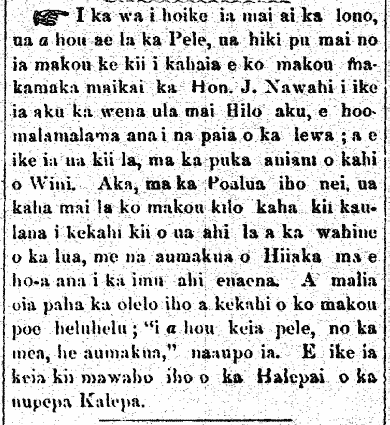 Emma Nakuina tells the story of Hiiaka, 1883. A Hawaiian Legend by a Hawaiian Native. A Legend of the Goddess Pele, Her Lover Lohiau and her Sister Hiiakaikapoliopele. The crater of Kilauea on Hawaii, is the residence of the Goddess Pele. She had eight sisters, all called Hiiaka, with some distinguishing ending, as Hiiaka-noholae, (Hiiaka living on the headland), Hiiaka-wawahilani, (Hiiaka the heaven breaker,) Hiiakaikapoliopele, (Hiiaka in Pele’s heart) etc. The latter commonly called the Hiiaka is the heroine of this legend. Pele had also several brothers Kamohoalii, Lonomakua, Lonoonolii, etc.